...care va putea detecta mai multe infractiuni in acelasi timp. A new speed camera is being tested that can catch up to five offences at once. The Asset camera - which could soon be headed for the UK - can pick out drivers not wearing seatbelts and can measure the distance between cars to spot tailgaters, while a numberplate recognition system targets those with no insurance or out-of-date tax. Oh, and it can measure how fast you're going, too. Asset (which stands for Advanced Safety and Support for Essential road Transport - we know you were wondering) is currently being tested in Finland, where it is being developed by a group that includes European universities and research centres, funded by the European Commission. Its creators hope that the new cameras, which have been under develeopment for two years, will be ready to roll out across Europe - and that includes the UK - by 2013. 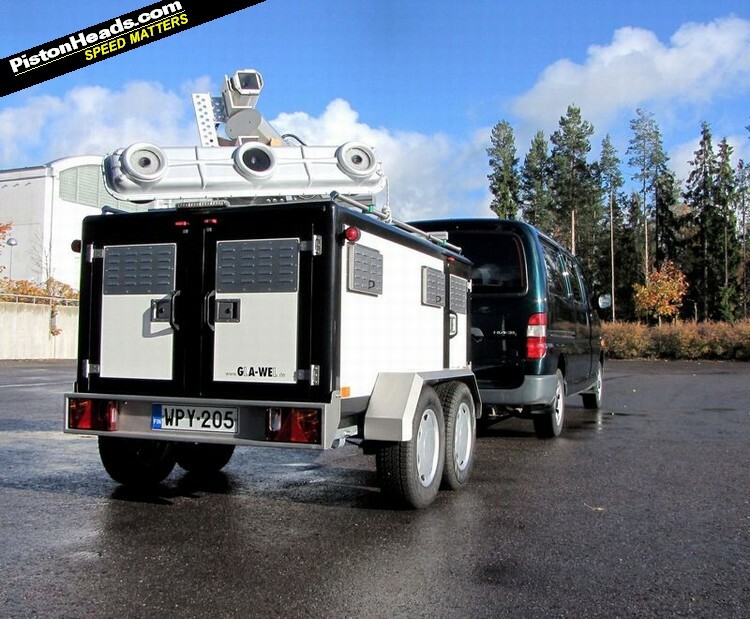 "The main intention is to support traffic police to supervise that the drivers follow traffic rules such as wearing seat belts, preventing over-speeding and maintaining sufficient distance to the front vehicle," Matti Kutila of the VTT Technical Research Centre in Finland, where the system is being tested, told The Guardian. "This of course is beneficial for road safety." Motoring groups in the UK have cautiously praised the Asset system - on the proviso it is a safety measure rather than a money spinner. "Tailgating is more dangerous in most cases than speeding so I think most motorists would welcome it," Said Edmund King, president of the AA. "We will need sophisticated technology to police the roads and there would have to be safeguards. But it needs to be done as a safety measure, not as a money-making machine." Meanwhile, a spokesman for the campaign group Speed Cameras Dot Org told The Guardian: "We cautiously welcome a device that can detect several potential motoring offences, but it remains to be seen how accurate it is and how fairly it will be used. The main actions that cause the most accidents, namely not paying attention to the road, misjudging distances and other drivers' intentions, cannot be detected by a device of any sort." Prababil ca va aparea in mai multe tari europene si nu numai in UK. In romania nu cred ar face treaba pentru ca nu este acelasi sistem ca in UK unde trebuie sa ai discul de la asigurare si taxa de drum in geam. azi-maine o a fie ceva device care sa ma amendeze daca ma gandesc la mancarea ce ma asteapta acasa in farfurie in loc sa ma concentrez la drum..
Sincer nu ma supara treaba cu taxa de drum si asigurarea din punctul meu de vedere este bine venit. pai la tine taxa de drum poate e chiar taxa de drum. la noi se ia taxa de drum din antichitate (inclusa in pretul benzinei) si noi dam tin gropi in gropi...care drum frate?? Nu sunt super drumuri nici aici stai linistit si in plus pentru un 1,8 platesc 550€ pe an plus taxe in pretul benzinei. pai ia alta masina pt daily. Yula, eu platesc 269€ pe an impozit in Germania. Asta pt ca am nesimtirea asta de cilindree si ca e si Diesel. Daca ar fi fost benzina ca ale voastre plateam mult mai putin. Faza cu motoarele Diesel platesc mai mult la impozit este istorica pt ca ceva ani in urma diferenta de pret intre Diesel si benzina era destul de mare (cam la 50-60 de centi) si niste minti patrate s-au gandit ca cei care au Diesel sa plateasca la impozit mai mult. Tot e bine ca de la anul o sa scada, nu cu mult, dar scade. O sa scada si asigurarea (acolo e destul de babana reducerea >150€).